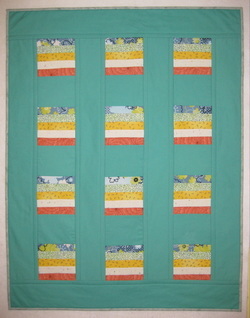 This four session, beginning quilting class is for new quilters. Skills taught include rotary cutting, machine piecing, straight line machine quilting and binding. Basic sewing machine skills and a sewing machine in good working order with 1/4" piecing foot with guide and walking foot are required. Contact store for fee and to sign up. Like penguins or know someone who does? Make this 22” x 22” wall hanging of three king penguins on the beach. Machine applique technique. Class includes Barbara’s original pattern for the penguin family, instruction in raw edge fusible applique and practice with free motion quilting. Confident beginner level. 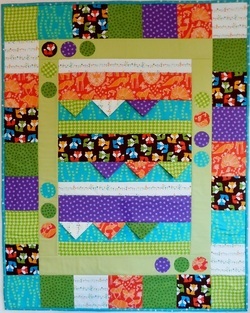 Use Gudrun Erla's On the Move pattern to make this fun, colorful kid's quilt and learn quilt as you go method. Finished size 35 1/2" x 45 1/2". Confident beginner level. Tomorrow's Treasures, 2110 Priest Bridge Dr., Crofton, MD 410-451-0400 www.tomorrowstreasures.info. Learn layered raw edge applique and applique with sheers. Intermediate skill level. Get your creative juices flowing with three techniques in one art quilt. Use stencils to make designs, stitch the designs onto fabric with decorative thread in the bobbin, and accent the designs with paint. No drawing or painting skills needed. Sewing machine in good working order required. Intermediate skill level. Explore mixed media techniques including creating a background with Inktense blocks, stenciling on fabric, fashioning 3D butterflies, and binding with metallic thread. 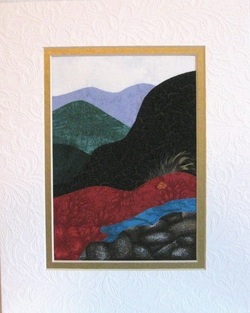 Learn how to construct a landscape with fabric. photo mat. The technique can also be used for hand or machine applique. Beginner friendly. 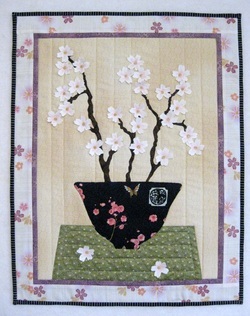 Celebrate spring and our beautiful D.C. blossoms with this 18" x 24" wall hanging of a bowl of cherry blossoms on a table. Fusible applique technique, with three dimensional flowers accented with colored pencil and thread. Confident beginner/intermediate level. this fun class. You'll complete two bowls in class - leaf for fall and poinsettia for winter - using two different firm interfacings. Go home with everything you need to make the cherry blossom bowl for spring and shell bowl for summer. Confident beginner level. Learn this technique made popular by Ricky Tims. Use novelty fabrics and add borders for a colorful wall hanging. Or make yours with hand dyed fabrics for a blended look that makes a great background for applique. Easy and fun for beginners and experienced stitchers. For the class we will do the Original Harmonic Convergence (Project One in the book). No free motion skills? No problem! Quilt and applique this wall hanging with just your machine's walking foot. Finished size 24" wide x 18" long. Confident beginner/intermediate skill level. Use your fabric scraps or fat quarters to turn a simple line drawing into a fun, colorful wall hanging. Bring your own, a child's drawing or clip art of an animal, or you can trace my dolphin drawing and add your own patchwork design. This is a technique class for all levels. Basic machine applique and quilt construction skills are needed to complete the project. Do you like quilting and gardening? This class explores the philosophy and schools of the centuries old Japanese art of flower arranging called Ikebana. We'll apply some of the principles to construct a summer flower arrangement using fabric. 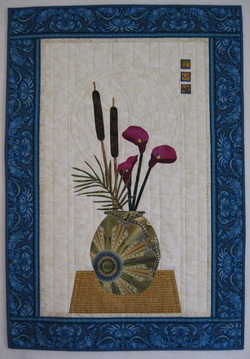 Patterns will be provided for a vase, calla lilies, fern and cat tails. 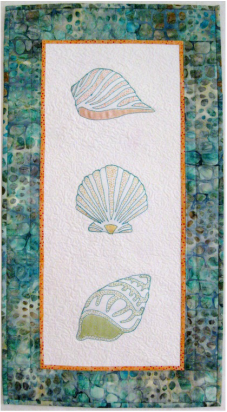 You will arrange these elements into an applique to take home and fuse to a background to use for 24" x 36" machine applique wall hanging. Complete instructions to finish the quilt provided. Confident beginner to intermediate skill level. 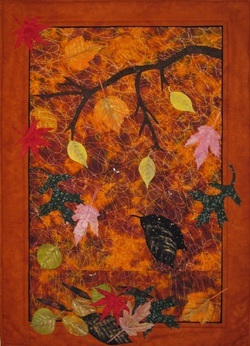 Get a jump on your fall decorating with this 22" x 30" wall hanging of colorful autumn leaves. You'll make the leaves from batik fabrics and burnish them with metallic rub-on paints. 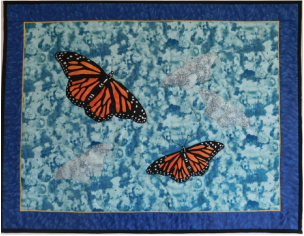 Assemble your design with fusible web applique and you are on your way to a beautiful art quilt. Easy technique for all levels. Basic machine piecing skills needed to prepare background prior to class. Machine applique and quilt construction skills needed to complete the project. Confident Beginner/Intermediate level.